Hey y'all! Erica from Eating with Erica here at Belle Isle to give you the inside scoop on how I turn out the Ultimate Spiked Hot Chocolate Bar. Winter is finally here, which means it’s time to turn on Mariah Carey's "All I Want for Christmas Is You“ while getting some kisses under the mistletoe. It's also time to start getting creative with your holiday parties! When I am hosting my holiday gatherings, I am always stumped on a couple of how-to things: how to impress my guests & how to create an epic recipe in under an hour without breaking the bank, all while looking flawless. Talk about a dilemma. But don’t fret! 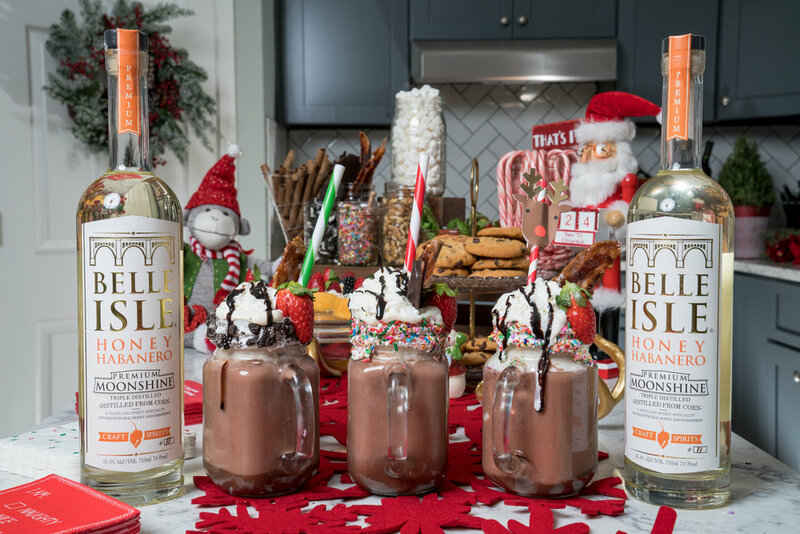 Save your holiday season with a spiked hot chocolate bar using Belle Isle Honey Habanero. What I love about a hot chocolate bar is that it can be so simplistic, yet impressive. You can put together a creative holiday drink bar in less than 45 minutes in an awesomely frugal way. On average, a holiday bar will run you in the range of $45 to $60 and will increase depending on the ingredients that you select. Of course, to create your hot chocolate bar, you first need to start with hot cocoa. The hot cocoa should be really creamy - the more chocolatey, the better. If you are on-the-go, instant cocoa will work just fine, but remember to use milk instead of water! If you have extra time, you can create hot cocoa in the slow cooker. Once you’ve decided on your cocoa, you’ll need to choose the type of mug you'd like to drink your hot chocolate out of. I highly recommend using Mason jar mugs. They are the easiest to decorate and the mugs are perfect for photos. You definitely want to be sure that the end product is photo worthy. C’mon! Do it for the ‘Gram! I spiked my hot cocoa with Belle Isle Honey Habanero. It blends so well and gives a slight hint of spice. If you aren't into spiciness or that "kick," no worries! You can use Belle Isle Black Label. Your bar won’t be much of a sight without tasty, unique ingredients. The more ingredients you have, the fuller your bar will look which will give it that WOW factor - the more ingredients, the better! I added some of my favorite ingredients such as peppermint, whipped cream, strawberries, sprinkles, and crushed Oreos. I am known to be a little extra, so you know I had to create some over-the-top items such as chocolate-covered bacon. It is also important you remember to invite a variety of guests who will love creating their hot beverages. To make your bar more festive, add some charming Christmas décor, like Poinsettia plants, festive napkins, and classic Santa trinkets. The goal is to leave your guests thinking that Martha Stewart did all of your holiday decorating. There is so much variation and possibility when creating your very own hot chocolate bar, so it’s unlikely that anything will go wrong. If you are still apprehensive, no worries! There’s still time to do a trial run of your hot chocolate bar so you can rest assured everything will run smoothly on the actual day of your holiday gathering. I know your "bar" will be a hit! Make sure that you enjoy, have fun, and drink responsibly. Happy Holidays! In a large saucepan, whisk together the cocoa powder, sugar, salt, and boiling water until the sugar is mostly dissolved and no lumps remain. Add the milk and vanilla extract and turn the burner to LOW HEAT. Do not bring to a boil. Heat until drinkably hot. Remove from heat and keep warm in a slow cooker, if desired. If using Belle Isle Honey Habanero, add room-temperature Belle Isle to the cocoa after removing from heat, and whisk thoroughly.